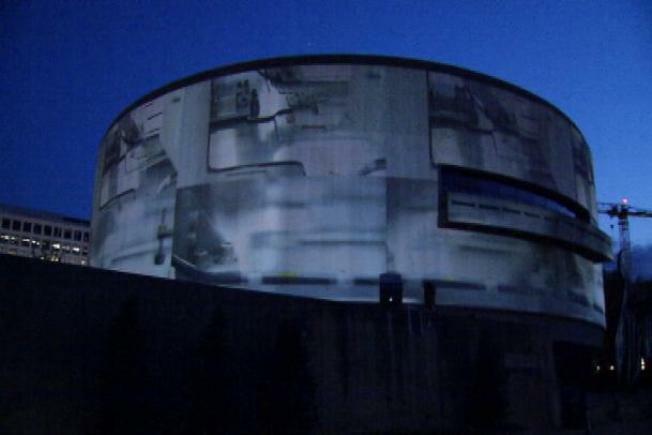 Song 1 is a 360-degree video installation on the exterior of the gallery. Is there more say about Doug Aitken's "SONG 1?" Briefly, there is: The 360-degree projection has been extended to May 20. It was originally set to end this weekend. Also, this Friday's "Happening" -- for which the museum will turn off the soundtrack to the massive installation and allow a handful of Pitchfork and Wire-approved acts to perform -- now has a full lineup. Geologist and the pair of Tim McAfee Lewis and Leo Gallo will perform, along with High Places, No Age, Oneohtrix Point Never, and Nico Jaar. Geologist, you'll remember, is the lone D.C.-residing member of Baltimore-bred experimental-pop favorites Animal Collective -- a band that (so much news!) just released a pair of new songs. The Hirshhorn has been taken over by a cinematic experience that's stopping people in their tracks. Haven't been by yet? Take a peek here. A symposium inside the museum Friday will feature Aitken, David Allin, Aaron Betsky, Geeta Dayal, Sasha Frere-Jones, Dean Kuipers, and Zabet Patterson. Did you check out that new side-scrolling Hirshhorn website? It's sleek and pretty, if a little buggy on first pass. They'll figure it out. "SONG 1" Extended at the Hirshhorn, and Geologist Added to Friday’s "Happening" was originally published by Washington City Paper on May 8, 2012.